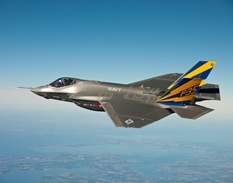 An article posted on The Hill website warns that sequestration could kill four or five F-35 fighter jets in 2014 if the across-the-board cuts are not averted. The second round of sequestration cuts, expected to take effect January 15, 2014, threaten to reduce the Pentagon’s budget by $52 billion. Under the first round of cuts, Pentagon officials were forced to moved money around to ensure production of the F-35, however officials report that’s no longer an option in this round. Congress must act immediately to reverse the second round of automatic cuts and, instead, focus on creating jobs. The F-35 program, critical to our national defense, provides good-paying American jobs and shores up our unstable economy. Further cuts to the program could devastate our nation’s already-fragile economic recovery.